Cloning cost 100 bonus points each time. 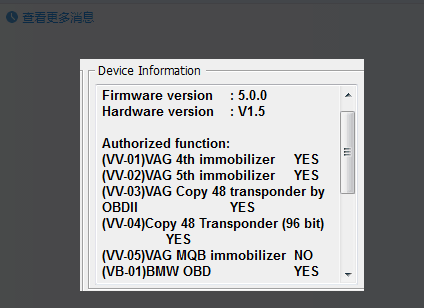 This is only VV-04 authorization,if you also need VV-03 VAG Copy 48 Transponder by OBDII Function Authorization Service,please check SV86-S2. 1. VVDI2 has two 48 copy authorization OBD and 96 bit,but VVDI Key Tool only 96 bit. 2. If you have both VVDI2 and VVDI Key Tool, purchase to activate VVDI2 ID48 96 bit authorization, bind VVDI2 with vvdi key tool, your VVDI Key Tool can get too. But if you have vvdi key tool,buy VVDI2 later time,bind VVDI2 with VVDI Key Tool, your VVDI2 can not get it free. In other words,this process is irreversible,VVDI2 to vvdi key tool is OK, but VVDI Key Tool 96 bit authorization,then to VVDI2,you need buy another authorization. VVDI Key tool supports all ID48 96bit clone up to 2017-18......success 100%. Question 1. what is Xhorse VVDI2 Copy 96 bit 48 Supported list? Question 2. What is the calculation cost and requirements? Question 3. How to authorize and who can help authorize? Question 4. How long will the authorization succeed? Question 5. Can I get the MQB license if I buy authorization of VVDI2 Copy 96 bit 48? Answer: Support all car types with 48 transponder without OBDII, only add spare key. 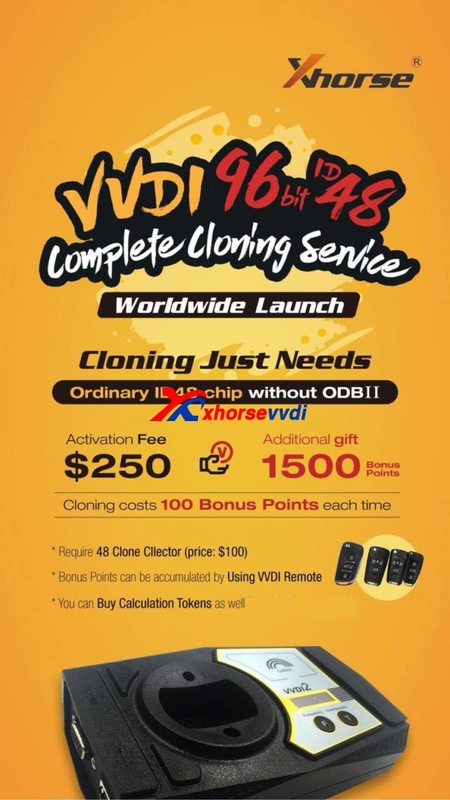 About VVDI2 96 bit ID48 clone service, what is the calculation cost involved? I understand that 1500 bonus points are provided with the activation, with 100 pints used each calculation. it looks like 100 points cost 8$ but is to different options. Answer: Usually the authorization will succeed within 24 hours, if the time lasts longer, the main reasons are it is the weekend and the time difference too. 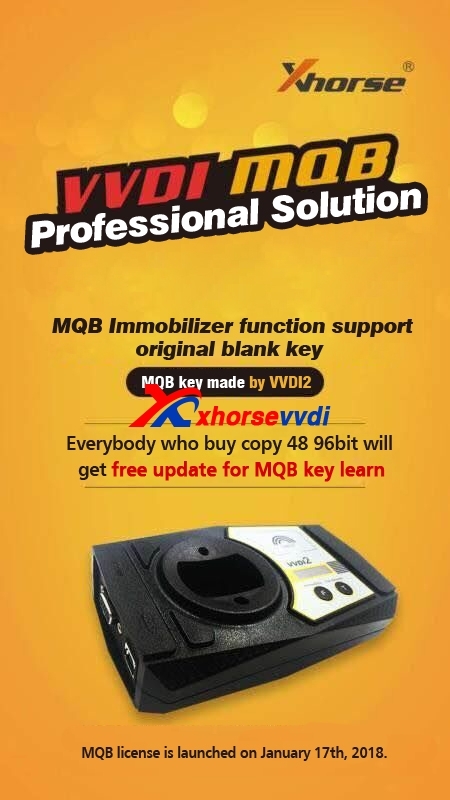 Answer: Yes, EVERYBODY WHO BUY COPY 48 96bit WILL GET FREE UPDATE FOR MQB KEY LEARN.